Santa Barbara County Sheriff deputies had roughly nine months' worth of funding to raid illegal cannabis grows alongside federal authorities in the Los Padres National Forest. Now that the money has run out and although Sheriff's officials say other illicit sites remain, at least 100,000 illegal pot plants will never enter the black market. Lt. Brian Olmstead, who heads the Sheriff's Office Special Investigations Unit, told the Sun the work began back in late January and wrapped up at the end of September. He said the nine different locations cleared by enforcement teams were largely scattered across remote areas in Santa Barbara County off of Sierra Madre Road, just east of Santa Maria. Deputies and officers used helicopters to drop into the illicit sites due to the rugged terrain that makes the locations otherwise extremely difficult to access. "There's really no trails except the ones they [the illegal growers] made," Olmstead said. The raids resulted in zero arrests but officials say the sites were characteristic of Mexican national drug cartel operations discovered in years past. Olmstead said the growers were tough to apprehend due to the sound of the helicopters alerting criminals of agents' imminent arrival and that their knowledge of the terrain at times surpassed investigative and enforcement teams. 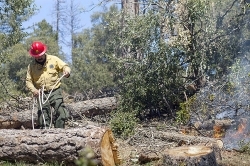 The Sheriff's Office, state, and U.S. Forest Service plan to carry out the same operations next year to discourage such grows on federal land, officials say. Not only do the grows threaten the public with potential violence if they stumble upon such sites, but they also have a significant impact on the environment. Illegal grows divert water from streams and rivers, commonly use dangerous and banned pesticides, and import propane tanks to power their operations (a potential fire hazard). Illicit cultivators also leave behind hundreds to thousands of pounds of trash, according to enforcement officials. Olmstead noted that even with pot being legal in most of California, there would still likely always be rule breakers, especially on public land. "I think part of the reason they like it out there is it's still a remote location and these organizations have been doing it for so long," he said. "They're obviously still making a profit off it because they are still doing it."